Since the dawn of video games, shooters have dominated the gaming landscape. The thrill of running around shooting your enemies while saving your life in the process is unlike anything else. So its no wonder when people started gaming on their phones, they craved that thrill. Developers heard the demands of the masses and we got a plethora of Android Shooting Games. The game which started the Battle Royale craze is here on Android to satisfy all your shooting desires. PUBG Mobile is a masterpiece no matter how you look at it. From the graphics to the gameplay everything is top notch. The game supports cross platform play between IOS and Android players. With a match being decided on the base of skill rather than Pay to win. And most importantly the developers are hard at work updating the game with numerous bug fixes and fresh new content. The game is absolutely free to play with in-app purchases. After carrying out covert assassinations and high profile target eliminations on consoles and PCs, Agent 47 has made its way to the small screen. Hitman Sniper is a shooting game with a twist. You have targets to eliminate but you are not allowed to pursue them. From a vantage point outside the target zone, equipped with a sniper rifle, you have to carefully plan your every move if you want to achieve your goal. This may sound as a limitation but Hitman Sniper delivers on its promises and stands atop the Best Android Shooting Games throne. It is a one time purchase on the Play store. Critical Ops is not your average shooter. The game may not look as pretty as some other high budget games like Hitman Sniper but don’t judge the game by its look. Once you play the game you’ll realize the game’s beauty lies not in its graphics but in its intricately designed gameplay. Every map is unique and matches between players are decided purely on tactical ability and skill. Crtical Ops deserves a place in our list and it deserves a place in your list too. If every other game on our list of Best Android Shooting Games touts its realistic looking environment, then Guns of Boom is the only one that revels in its cartoonish glory. It features detailed, vivid environments that look beautiful. The gameplay is easy enough so that newbies can join the game yet it has so much depth that matches can become competitive if Pros decide to jump in. Gun of Boom is definitely worth checking out if you are looking for something that is both enjoyable and requires some skill to master. Its free on the Play Store with in-app purchases. Gameloft is a household name when it comes to quality mobile games. It has been releasing stellar games on Android for over a decade now. 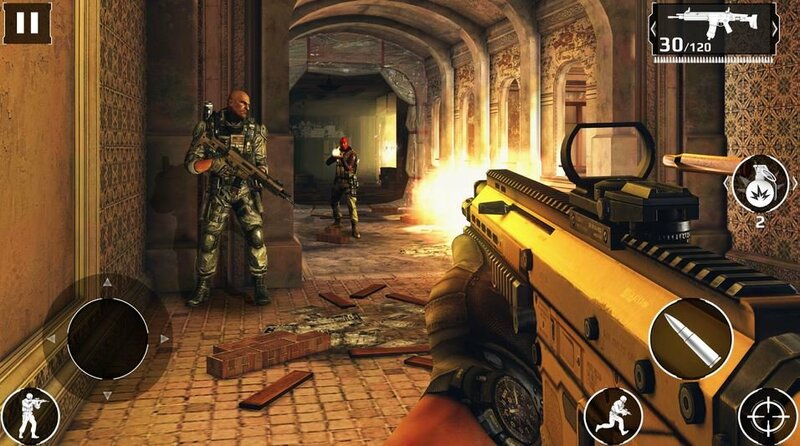 When it released Modern Combat 5 way back in 2014, it took the smartphone gaming genre in a whole new dimension. The game redefined what smartphones games looked like. And it has only gotten better since then. Gameloft has added various new game modes including a multiplayer mode that takes the game out from the campaign driven, single player mode to the esport category. Players can now enjoy competitive multiplayer matches. The reward system of the game is also one of the most sensible ones that we have seen among Android Shooting Games. Its free to play with optional in-app purchases. So this was our list of Top 5 Best Android Shooting Games. Do you agree or disagree with us? Sound off in the comments!